FREMONT, CA AND MOORESVILLE, IN - NOVEMBER 7, 2017 – Solaria Corporation, global provider of solar module technologies, and, Linel, a premier fabricator of customized architectural glass and metal products, today announced that architects can now access building integrated photovoltaic (BIPV) solutions, from Linel, powered-by-Solaria. For decades, Linel has taken projects from design to installation as a full life-cycle subcontractor whose materials and suppliers are directly influenced by the needs of project architects. Linel now offers BIPV sloped glazing systems to answer a growing demand for architectural solar solutions from building developers and designers producing leading edge plans for new projects. "We're always looking for new ways to add value to our sloped glazing projects, and Solaria's PowerView™ BIPV is a product that offers impressive solar performance without compromising aesthetic quality," said Brian Murphy, Product Design Engineer, Linel. "The economic benefit is clear, the contribution toward sustainability is real, and the design is flexible. We believe the industry is poised to embrace BIPV sloped glazing in a major way, and this partnership has Linel and Solaria ready to provide an industry-leading system." Linel has built a reputation for designing and delivering a full spectrum of high-performance architectural products, and partnering with innovative suppliers to meet the most creative and demanding design specifications. By offering architectural solar solutions powered-by-Solaria, Linel can address the architectural community’s increasing demand for solar skylights, atriums, clerestories, sunshades, patios and canopies. Now, in addition to typical rooftop photovoltaic systems and louver photovoltaic systems, Linel will capitalize on the opportunity to establish the company as a recognized market leader as architectural solar grows to significant volume. Solaria’s PowerXT® rooftop solar solutions provide high-performance solar panels that produce up to 20% more energy than conventional modules. These high-density solar panels are optimized for rooftop applications and leverage a highly refined manufacturing process which results in a significantly higher energy yield than typical PV modules. It not only delivers high power but also improved shading tolerance, premium appearance and durability. Solaria’s PowerView™ architectural glass solutions deliver the unique combination of attractive aesthetics, compelling economics, high performance and high power density. This enables the optimization of thermal performance, effective daylighting, glare control and power generation. Solaria’s solar windows are easily customizable and offer design flexibility to adjust for a wide variety of sizes, glass type dimensions, coatings, Vt, and voltage. Linel is the premier fabricator of custom architectural products. Each Linel product is custom-suited to meet the aesthetic and performance specifications of our customers. Contact Linel to request project-specific details or design assistance, and let Linel put 40 years of architectural product experience to work for you. For more information, please visit www.linel.co. Solaria Corporation is a solar technology company that is paving the way for distributed, clean power generation through optimized solutions for a range of applications. Leveraging its proven core technology, field performance and sophisticated automation, Solaria delivers solutions that address a unique set of requirements for the rooftop and architectural solar markets. Solaria’s cell technologies enable leading glass fabricators to adopt solar technologies into their product offering. In turn, providing builders, developers and architects aesthetically pleasing, easily integrated, highly customizable residential and commercial solar products that can help enable net zero energy buildings. Solaria headquarters are in California. For more information, please visit www.solaria.com. Northwestern University is adding an exciting blend of athletics facilities to their Evanston, IL campus. Perkins + Will designed the project, which includes competition, practice, recreation, and educational venues. Linel will be providing a custom panel system for the structure's facade, using a design that maximizes panel area and minimizes joint width and system depth. Linel will also be using its internal paint line to provide the panel system with a Kynar finish from PPG. Find out more about the project here. 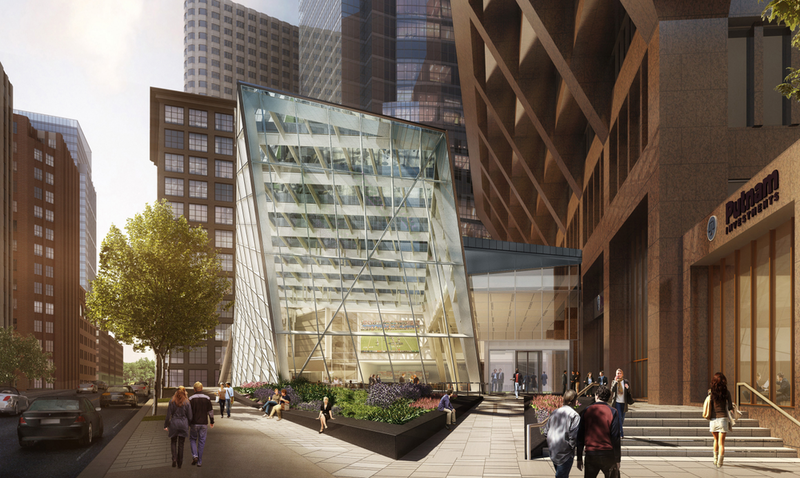 Linel is providing a custom glass atrium for 100 Federal Street, located in the financial district of Boston, MA. Boston Properties tapped Perkins + Will to design the atrium addition, which will include retail and garden spaces for public use. The Turner Construction Company will oversee the project, which is project for completion at the beginning of 2018. The custom framing for this project allows the low-profile, structurally glazed system to fit along the steel substructure with minimal visual impact. Element 28 is a 15-story luxury apartment building designed by R2L Architects, and developed in the central business district of Bethesda, MD. Linel is partnering with R2L to provide a unique architectural sculpture for the Element 28 public plaza. The sculpture integrates a skylight, canopy, and green roof to artistically conceal an access stairway to the parking garage below. The skylight and canopy use laminated glass featuring Vanceva colored PVB interlayers, and required Linel to cut the custom glass patterns in-house. The support framing is fabricated from aluminum plate that is cut, beveled, formed, welded, and painted to create a seamless leaf-like structure. The architectural sculpture symbolically displays the sustainable design principles that R2L Architects emphasized throughout the design of the entire project. Read more about the project on R2L's Element 28 project profile page. Linel will be providing the glazing for a 20,000-square-foot atrium at the Draper Laboratory headquarters in Cambridge, MA. Elkus Manfredi Architects designed the $60 million addition, which will transform an existing outdoor courtyard into new collaboration and exhibit space for Draper. The custom glazing system is structurally glazed, with pressure-equalized water infiltration management. The design employs split horizontal members and custom silicone inserts, hiding the rafter splices and delivering a clean aesthetic. The project will have insulated, laminated low-e glass with a custom ceramic frit. A visual mock-up and a performance mock-up will be completed in 2016, with the project scheduled for completion in 2017. Read more about the Draper Labs atrium addition in their announcement from February, 2016. 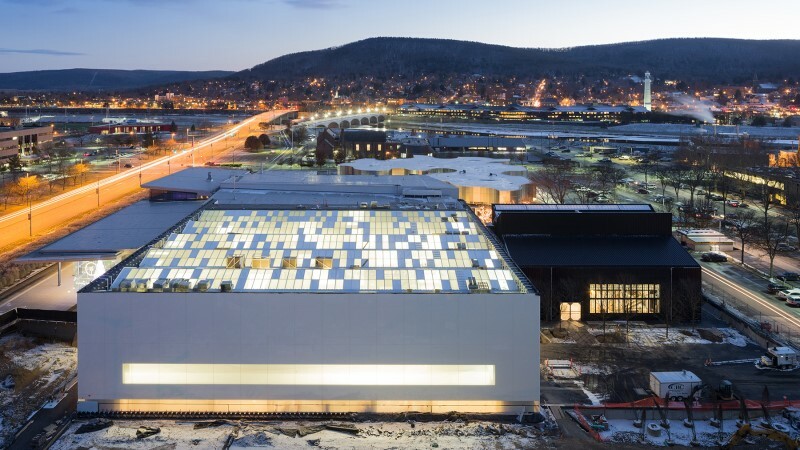 An addition to the Corning Museum of Glass in Corning, NY was recently completed. The project was designed by architect Thomas Phifer and Partners. Linel’s scope on the project included an undulating ridge skylight covering nearly 25,000 square feet of roof area, with a mix of different glass make-ups and infill panels. Linel also provided a unique internal sunshade system, made of vertically-oriented concrete beams (3 ½” wide by 4’ deep, spaced 3’ apart). The combination of skylight and concrete provided an optimal daylight system for the museum while adding a unique aesthetic to the structure. Find out more from this article in the March, 2015 issue of Architectural Record. Make Linel your provider of premium architectural products. Contact us now!